Seven months ago I had a chance to attend a presentation by investment manager David Burrows. You’re not going to find his name in the Wall Street Journal or a quote in a Bloomberg news article, but that doesn’t mean he’s not worth listening to. He is. Burrows is the chief investment strategist of Barometer Capital, a mid-sized asset management company with about $900 million under management. It’s not the amount of money Burrows manages that’s important, it’s how he manages it. And if we pay close attention, we can learn a lot (or at least get a timely reminder). I first came across Burrows early last summer. The markets were down and headed much lower. I was looking for ideas from who has successfully made it through past bear markets. 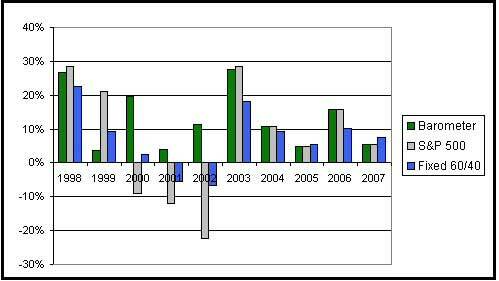 As you can see in the chart below, Burrows has been one of the most consistent managers over the past 10 years (he’s the green bar). His strategy moves up with the markets, but not down with the markets. So naturally, he’d have some ideas on how to make it through the coming storm. To be completely straight with you, when I first saw his presentation last summer I was a little disappointed. Burrows explained his strategy, his top-down and bottom-up disciplines, etc. – which are effective. But when it came time to talk about where he saw “pockets of strength” at the time, I was a bit worried. Burrows said he was deep into agriculture and energy. He said he was about 45% energy, 8% agriculture, and about 25% cash. This was June of 2008 and these sectors were quickly running out of gas. Since then, energy and agriculture have been two of the worst performing sectors around. I figured Burrows might be licking his wounds, but he should be good for an idea or two. So it was probably worth an hour or so to hear what he had to say (free coffee and top-notch pastries sealed the deal). But he wasn’t down much at all. His funds held up pretty well. He did so relatively well, Barometer’s “High Income Portfolio” was ranked #6 out of 555 in that category in 2008. He doesn’t make the common mistakes most investors make. It really is just that simple. So, let’s take a look at what separated his performance from the pack. And what he’s doing and the average investor is not doing. I spotted six of them pretty easily. 1. Buy on Weakness – Burrows is confounded by the amount of investors who are willing to buy on weakness. Don’t get me wrong, it makes a lot of sense to buy stocks when they’re down. And, hey, nobody wants to buy at the top. Burrows says principles are much different. His investment system focuses on finding strength and buying it. Average investors, on the other hand, like to buy something just because it’s down even though it doesn’t make any sense at all. For instance, who are buying Detroit’s Big Three and banks right now? Most of these companies have no hope of surviving, and if they do, there won’t be much equity left for investors anyways. And when there’s no strength to buy, stay away. Burrows moves to cash when there is no strength in the market. In October and November he was about 70% and 55% respectively. Where’s the recent strength been in today’s markets? As you might expect, it’s what we’ve been focusing on – Healthcare (primarily stem cells and other technology) and Agriculture (farmland!). Stick to strength and businesses and assets you actually want to own. 2. Thinking Like an Analyst – Another common mistake investors make is when it comes to the details. Burrows points out they spend all their time pouring over individual companies’ financial statements, margins, market share data, and other company-specific data. This is what analysts do as well. They painstakingly read the annual reports, go over every source of revenue, and determine the best companies within a given sector. By nature of their jobs, they’re not focused on the big picture. They’re just responsible for finding the best in their coverage universe (it’s also why managers of financial sector funds who may have lost 50% of their investors’ money, yet still “beat the benchmark” expect sizable bonuses). Burrows’ research concludes which stocks you invest in only account for 20% of the total return earned. Meanwhile, the overall market accounts for 50% and which sector you invest in accounts for 30% of returns. As a result, wouldn’t it make sense to spend more time picking a market sector rather than an individual stock? Still, most average investors don’t and the result is…well, average returns. 3. Selling Winners, Holding Losers – Taking a loss is the hardest thing to do. Not only are you admitting “I’m wrong” in a way, but you’re also paying a financial price for it. All too often average investors follow the old adage, “No one ever lost money taking a profit,” too early. The opportunity to book a 10% or 20% profit can be very enticing, but it often turns out to be a very costly move. The key to getting truly wealthy in the market is cutting losses early and letting the winners run. Burrows achieves this by keeping tight stop-losses, so he doesn’t ever have to take any big losses. He also ratchets up the stop-losses periodically to ensure he “locks in” profits and still enjoys any upside. The easy way to do this is with trailing stop-losses. E*TRADE, Ameritrade, and most major discount brokerages have them, but most investors don’t ever use them. 4. It Feels Too Good to Feel Good – It always feels good to be running with the herd. Over the past few years there have been a few times it was almost impossible to lose money in some sectors. Uranium, oil, and agriculture come quickly to mind. I’ll admit, when you’re in these sectors and you’re getting 10% to 20% returns per month it feels good. Whether the world is running out of food or oil, it feels good to be there. Of course, the good feelings don’t last forever in the markets. We’ve been over how bubbles form before, in our 100% Free e-Letter, the Prosperity Dispatch. The thing is you never really know when you’re in one…or when it will be over. But if you’re constantly looking for signs that it’s over (rather than justification why “this time it’s different”) you’ll be able to get out before the bursting. Burrows points out this is one of the first steps to finding good investments. I agree completely. 6. Believing the Market is Wrong – This is the trickiest part of investing successfully. It’s the great grey area. To be successful, you’ve got to stand up and say the market is wrong – at times. Choosing those times correctly will lead to an immense fortune. Choosing those times poorly will lead to financial ruin. So the big question is when do you say the market is wrong? Inevitably you will be right sometimes and wrong sometimes. It happens. But that doesn’t mean you can’t invest successfully. This is why I prefer to find the extremes. When the market is at extreme highs or extreme lows, the risk/reward is greatly tilted in your favor. For instance, when oil is at $10 a barrel, we’re at an extreme. If it goes to $5, you’ll be out 50%. If it goes to $75, you’re going to walk away with 650%. When oil is at $50 a barrel it’s not at an extreme. If it goes to $25, you’re down 50%. If it goes $75, you’re only up 50%. In the first case, you’re risking 50% to make 650%. In the second case, you’re risking 50% to make 50%. If you’re going to take a stand against the market and say “it’s wrong,” the rewards better be worth the risk. That only happens at extremes. When it comes to my investment dollars, I can afford to wait for those extremes. Thinking the right way, finding the right opportunities, and avoiding disastrous mistakes are keys to becoming a successful investor. If you keep these six mistakes in mind, you’re much likely to have a much better 2009 than a lot of others. Any way you look at it, this year is set up to be a make or break year for many investors. There will be many who try to catch a bottom in some sectors and chase after unsustainable highs in others. Some ventures will prove successful, others won’t. There are a lot of uncertainties about the year ahead, but there’s one thing for sure: the raging bull market which covers up any and all mistakes will be on hiatus for a while.